Diets are usually boring. And restrictive. And just knowing we are on a “diet” makes us want to rebel against it. Even here at Raw Food Magazine headquarters we slide into some less-than-pleasant food habits sometimes, and it’s about time for a spring cleaning! But, instead of eating nothing but celery stalks for weeks (even though we adore celery), the best plan for your body is to pamper yourself silly inside and out. 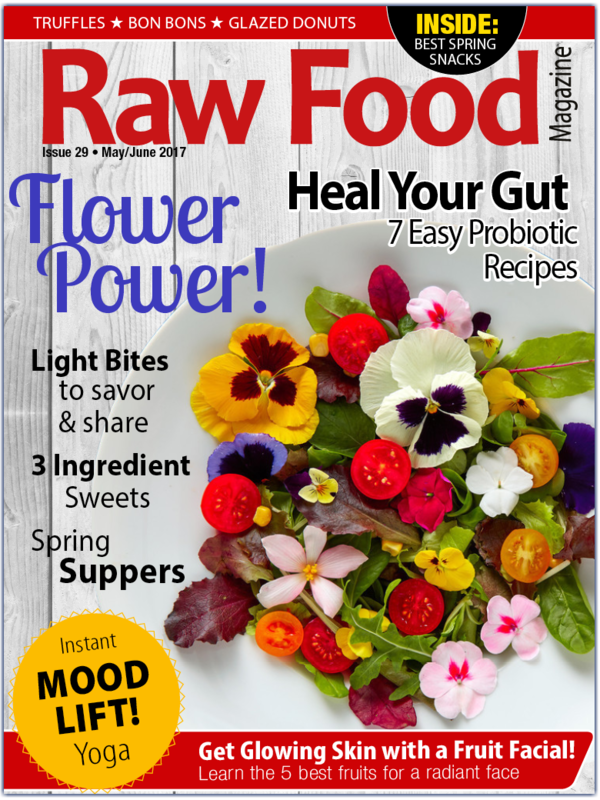 This issue of Raw Food Magazine is all about spring cleaning inside and out. From healing your gut, to glowing skin face masks and some simple sweets to treat yourself because self-care ain’t a joke people! Don’t be hangry! Good food brings a good mood. If you get cranky just thinking of giving up your guilty pleasures for a fresher plate, never fear. Amidst the light bites and simple sweets, we even included a crazy-yummy glazed DONUT recipe for goodness sakes. Fresh, healthy eating is delicious, fun and–especially this time of year–exquisitely beautiful. (We prove it in this issue). Martha Stewart’s got nothing on these stunning suppers adorned with edible flowers! Let this season be so happy you dance in the shower. Plant flowers and eat them, too. Give yourself a refreshing fruit facial. Whip up some 3 ingredient sweets that impress at every cookout. And stretch it out to Adam Levine’s favorite yoga playlist (we couldn’t help ourselves). Bring on the good food and happy mood! It’s time to treat yourself right, inside and out.